- Wash bhindi under tap water and pat them well with a piece of cloth. - Make round cuts in even size and keep aside. - Heat a small pan and dry-roast besan and crushed fennel seeds together till it start releasing nice aroma. Transfer it to a small ball and cool down to room temp. - Heat oil in kadai and add cumin seeds and hing. - Once it starts crackling, add ginger garlic paste along with chopped onion and capsicum. 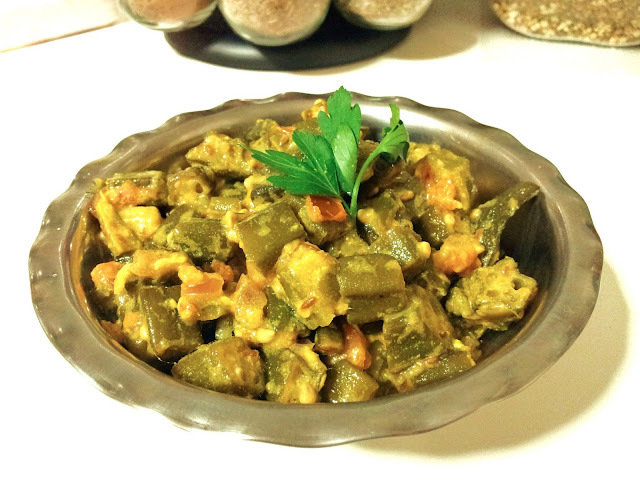 - Saute it for a while and add bhindi cuts into it and cook for around 10-12 mins until its soft and tender. - Mix besan, fennel seeds and yogurt in a bowl and whisk to remove all lumps. - Add chopped tomato, yogurt mix and all the spices into kadai and mix well. - Vertically cut bhindi can be used as well.